We’ve all seen the plight of our wildlife wordwide recently on TV caused by the plastic in our oceans. Our hedgehogs and other wildlife face the same plastic hazards on land. I first got started as a hedgehog rescue due to the dangers caused by plastic waste. I spotted a hedgehog out of the window that looked like it had a leaf stuck to its spines. I thought it was so cute that it had a leaf on it and I called it ‘leaf hog’. It wasn’t until several days later when I managed to get closer to the hedgehog that I realised it wasn’t a leaf. The poor hedgehog had got tangled in the plastic netting that is used for bird fat balls. The plastic was all around it, cutting deep into its flesh. How awful that something used to help one species, was causing immense suffering to another. Hedgehog trapped in plastic beer can rings. Photo: Dru Burdon, Jersey Hedgehogs. Plastic litter is all around us but particularly in hedgerows where hedgehogs like to live where it gets blown by the wind or thrown by thoughtless passers by. Hedgehogs can get tangled in any type of discarded netting (including football nets, garden netting and the netting used by Councils to cover recycling boxes), elastic bands and plastic beer can rings. They can also get their heads trapped inside discarded plastic packaging, cups and pots. This plastic waste can even be found in our own gardens. A couple of years ago I found a hedgehog wandering around in my own garden that had its head completely stuck inside the empty plastic bag from a hot chicken, picked up somewhere in the neighbourhood. It was attracted by the tasty remnants of the hot chicken, poked its head inside to get a lick and got the bag stuck entirely over its head. Even sadder, over the years I have been called out to a number of hedgehog nests in gardens that have been accidentally disturbed. These nests were not made of the leaves that you would expect to be used in a garden but were full of bits of plastic waste. A huge risk to any baby hoglets who may get trapped and grow up with plastic trapped around their bodies, which will get tighter as they grow. A ‘normal’ hedgehog nest made with leaves. This nest has been accidentally disturbed as they should not be out of cover. Many hedgehogs are now incorporating plastic waste into their nests. Hedgehog nest incorporating a plastic bag. A plastic hair bobble and other small bits of plastic were also found in the nest. Photo: Hedgehog Emergency Rescue Bingley. I know I am preaching to the converted here but please please do everything you can to help stop this plastic pollution. Pick up litter on your street. Encourage your neighbours to clean up local hedgerows. Join one of the many Great British Spring Clean events organised around the country. Don’t assume that your garden is litter free and remember that even an old plastic bag left in the garden to collect garden cuttings can look like a nest site to a hedgehog. I even had a call from a frantic lady at the local recycling site who was just about to throw a bin bag into the skip when she realised it had a hedgehog in it….. In addition, do everything you can to cut down on your own use of plastic packaging. I always take a bag with me when I am out on a walk in the city or countryside and I take home as much plastic waste as I can find. Sadly, this is something you just have to keep on doing. I cut up all the elastic bands and plastic beer can rings I find, before carefully disposing of them. If you do find a hedgehog trapped in plastic waste, it is vital to seek advice from a hedgehog rescue. The hedgehog may need treatment for constriction injuries or deep wounds. If a hedgehog has been trapped in netting for several days it will be dehydrated and starving and will need specialist treatment. Do not just cut them free and release them. 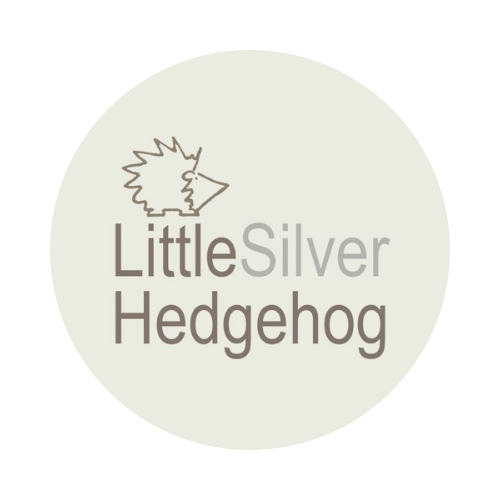 You can find out how to get in touch with a hedgehog rescue here. I run a hedgehog rescue in York. You can find out more about my work here. My work is entirely self funded and you can find out more about how to support my rescue work here. I also make silver jewellery inspired by nature and wildlife. You can visit my jewellery shop here. Lazy that’s all it is !! People really need to wise up about this. More responsible packaging would be another important step forward.